Lunchbox Bunch Canvas Bags! Eco-Friendly. Reusable Eco Bags. 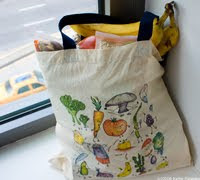 I am really excited about the reusable eco-friendly grocery bags in this product line. You can tote them to the Farmer's Market, Whole Foods or the beach! Other products include kids aprons, t-shirts and greeting cards. If there is a character/product combo you would like to purchase and do not see-please let me know!